I mentioned that Congress passed a budget yesterday. In the Senate, the vote played out almost exclusively among party lines, with only two Senators - Evan Bayh and Ben Nelson - crossing the aisle. They are the two most conservative Democrats in the 111th Congress, by voting record (I would throw out Bayh's record when he was musing running for President in the 2005-2006 Congress). And they didn't only vote against the budget - they voted definitively FOR a motion to recommit, which essentially would have substituted this budget for a Republican version. Enter Mike Johanns, the freshman Republican senator from Nebraska whose amendment preventing the Senate from passing climate change legislation through the reconciliation process passed on Tuesday. He also authored a different measure--not an amendment, but a "motion to recommitt"--which would have scrapped the budget that passed and replaced it with a much more conservative version. Most significantly, it would have indexed non-defense, non-veterans discretionary spending to the expected rate of inflation. It failed 43-55--for all intents and purposes a mirror image of the vote on the final budget resolution. Which is to say that Bayh and Nelson voted for the "Johanns Budget". So how did these two Republicans, who voted affirmatively for a Republican budget, justify their votes? They said it costs too much. "The administration inherited a lot of red ink in this budget, along with our ailing economy. But this budget still has trillion dollar-plus deficits in the next two years, and adds unsustainably to the debt. These are tough times, and the federal government needs to take a lesson from American families and cut down on the things we can do without. I respect the Administration offering an honest budget…but it just costs too much." "[U]nder this budget, our national debt skyrockets from $11.1 trillion today to an estimated $17 trillion in 2014. As a percentage of our gross domestic product, it reaches a precarious 66.5 percent. The deficit remains larger than our projected economic growth, an unsustainable state of affairs. This budget will increase our borrowing from and dependence upon foreign nations. I cannot support such results. We can do better, and for the sake of our nation and our children’s future, we must." These same two Senators, the ones whining and crying about fiscal responsibility, voted last night to shield millionaires from taxes on their estates, costing the government $250 billion dollars. WASHINGTON (AP) -- The Senate has voted to cut taxes on multimillion-dollar estates as it gets ready to pass a budget backed by President Barack Obama. By a 51-48 vote, the Senate embraced a nonbinding but symbolically important amendment by Arkansas Democrat Blanche Lincoln and Arizona Republican Jon Kyl to exempt estates up to $10 million from the estate tax. Estates larger than that would be taxed at a 35 percent rate. Tim Fernholz has more on this nonsense, including the good news that this will likely never make law. But let's just soak in this for a minute. The two ConservaDems who voted against the budget on the grounds of fiscal responsibility voted to give a handout to families with estates over $7 million dollars. Tremayne at Open Left has a chart showing just exactly who this tax policy would affect. 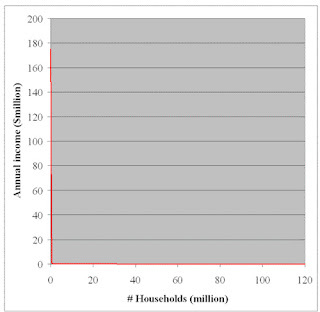 Hard to see it, but those with annual incomes in the millions are represented by the vertical red line on the left and those making less than a million (i.e., almost everyone) are the horizontal red line on the bottom. Lincoln and Kyl are concerned about the people on the vertical red line. So are Bayh and Nelson, America's worst people.